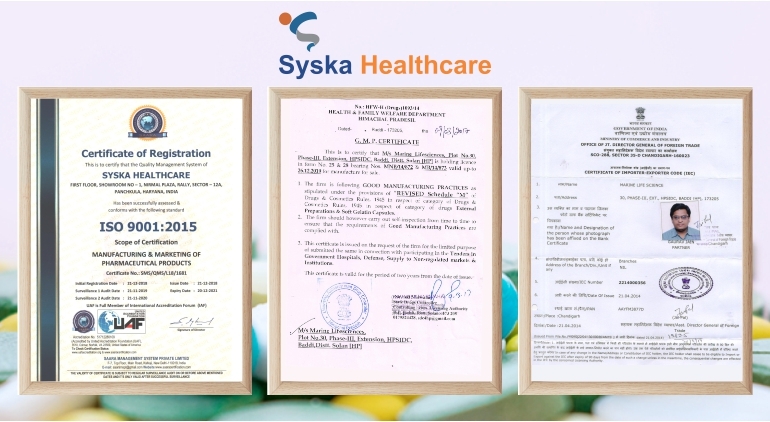 Syska Healthcare is vertically integrated healthcare company with one of the best pharmaceutical & nutraceutical manufacturing facilities of Soft Gel Capsule as per (Good Manufacturing Practices Act) guidelines of Baddi (Himachal Pradesh,India).To provide our clients with the finest quality range of medicines, a skilled team of experts is employed by our management. All of the team members are highly competent and hold in-depth knowledge regarding the modern processing techniques of medicines. Our management pays utmost attention towards providing our team members with a motivating work environment and all facilities that help them to carry out our business operations in a smooth and hassle-free manner. Our skilled workforce makes us capable to take and complete ample orders of clients within the predefined time-frame. Our quality inspectors also conduct several stringent quality control tests to deliver the best and effective grade of medicines within a promised time. Running under the headship of our mentor, “Mr Nitin Garg”, we have achieved the great heights of success.